YOU GUYS! IT’S PUMPKIN SPICE SEASON AGAIN! Sadly though, most all of the PS treats out there are also crazy full of sugar. No bueno. Here at Casa-de-B&B, we’ve been trying the Low-Carb lifestyle – specifically the Ketogenic diet. While this blog will not become a diet blog, we’ve both had some sweet sweet success. But until we say ‘I do’ next July, we gotta at least TRY to be good. Most of the time. Until the holidays or Oktoberfest or….. you get the picture. But then I had an idea! What if there was a way to enjoy the sweet goodness of pumpkin spice flavoring, without shoving an over-sized muffin and sugary Starbucks beverage in my face? 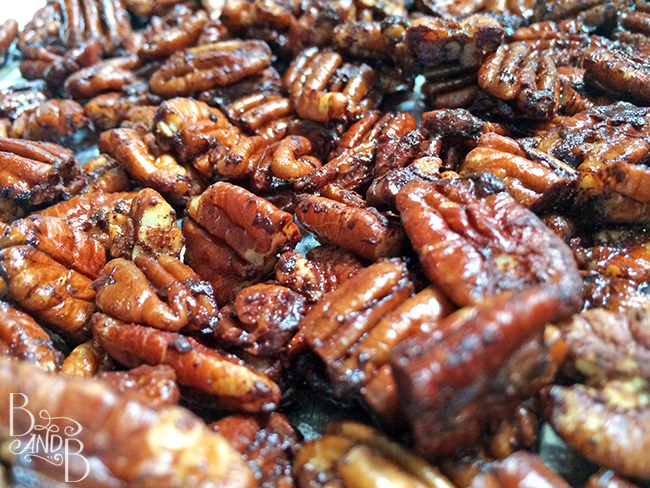 And so, I turned to my trusty sugar-free syrups and my favorite DIY treat, Pecans! I’ll warn, I largely eye-balled this so these quantities are estimates – adjust as you see fit. And if you’re not carb-counting, real sugar will do well too – and will give it a more candied texture. 1/3 Cup Coconut Oil – light flavor, GOOD fats! Set your oven to 325 degrees and line a cookie sheet (one with a shallow edge to it works best) with parchment or foil – whatever works best for you. In a microwave safe bowl, combine the coconut oil, syrup, stevia and whisk until blended. You may have to heat up your mixture a bit if your coconut oil isn’t liquefied already. Just depends on how toasty your home is. Add in the cinnamon – I really REALLY like cinnamon, so I used easily a tablespoon, but a teaspoon or two to start should work. Once mixed smooth, add in your pecans and turn them over and over until everyone’s been bathed in PS goodness. You may see some extra soupyness at the bottom of the bowl. That’s OK – we’re gonna work on that now in the Microwave. Put the bowl into your microwave for 1 minute. Stir and enjoy the delightful smell. Repeat at least once more. This will help get some of that candied texture going. Now, spread your pecans on the pan and place in the oven for about 15 minutes. I prefer my pecans crunchier, so I left them in for 20 minutes. They should come out a golden brown. Kind of like this. NOTE — this batch in the photo also has COCOA on it, so there’s some dark kinda-burned looking bits there. That’s just the cocoa, though depending on the amount of cinnamon you used, you’ll see a little of the same on yours. Let the pecans cool completely! Then, in-case there’s still some extra syrup on them, I like to pour them onto a paper towel and shake them about briefly. Now it’s time to enjoy! This makes a lightly sweetened flavor that isn’t at all over-powering. If you want full on saturated flavor, mix it up! Litterally! Shake on some extra cinnamon, or break out the cheaters Pumpkin Pie spice blend and before you pop the pan in the oven, dust on some extra flavor. It all depends on your own preference. Now, just try and keep your paws off these!